Park City, Utah (November 9, 2017) – Historic Park City needs help with the 2017 Electric Parade. 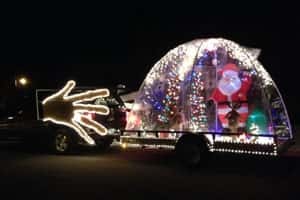 The organization is seeking participants to light up their vehicles, turn up the volume to holiday music and join the festivities as spectators take to Historic Park City’s Main Street for a colorful glow of holiday cheer. Participants have the chance to win cash prizes, awarded by a panel of local judges. “Saturday, November 25 is Small Business Saturday and is the perfect day to launch the Holiday season in Historic Park City,” said Michael Barille, Executive Director of the HPCA. “The Electric Parade will immediately follow the lighting of the official Town Christmas Tree in Miners Park and the lighting of the Main Street lights. We invite neighborhoods, families, groups of friends and, of course, members of the business community to enter a float. “ The parade, which is free and open to the public, is a carnival of glittering cars, trucks, trolleys, bicycles and other creative vehicles that celebrates the kickoff of the Holiday season in Park City. The event is fun and funky and is designed to showcase the Park City community in a unique Park City way. Participants will meet at City Park on November 25th at 5:45 pm and depart for Main Street at 6 pm. The route will proceed up Park Avenue, to the top of Main Street, down Swede Alley, across Heber Avenue and conclude on lower Main Street. Tips on how to decorate your vehicle using portable batteries or car batteries are available at www.historicparkcityutah.com. Depending on the level of creativity the expected time commitment to decorate a vehicle for the Electric Parade is two hours. There is no entry fee to participate, but participants must register online at historicparkcityutah.com. Holiday festivities continue in Historic Park City through the Holiday Season and include a Window Display Contest, a Strolling Santa, and carolers to spread Holiday cheer on select dates through the holiday season.